Home > Cameras > Grip & Lighting > Stop Shooting with the Canon 5D and Begin Shooting with the Sony F3! Stop Shooting with the Canon 5D and Begin Shooting with the Sony F3! Moving Picture recently performed a camera test with Director of Photography, Henry Lynk, using the Canon EOS 5D Mark II, the new Panasonic AG-AF100, and the new Sony PMW-F3L using Zeiss prime lenses in candlelight conditions. The star of the show was, without a doubt, the new Sony F3 camera. The following images are screen captures taken from an uncompressed Apple ProRes 422 HQ, MOV file. The cameras were set to an ISO of 800 and 1600 for these shots using a 50mm Zeiss CP.2 Compact Prime lens. Comparison of the AF100, the 5D, and the F3 under candlelight conditions. 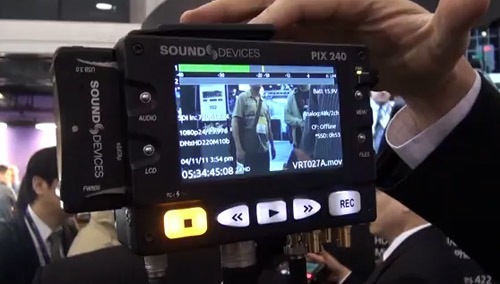 Panasonic AG-AF100 – The AF100 was the biggest disappointment of the bunch. Its ability capture clean imagery quickly falls away as lighting conditions diminish. Notice the complete lack of definition. The cheek, jawline, and neckline have a jagged video effect, and the hairline across the forehead is just a blur. Also, the shadows come across as blotchy and unnatural. 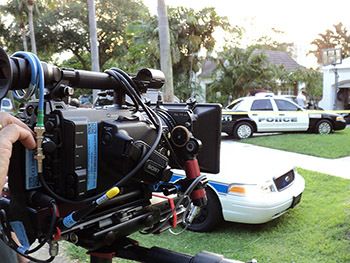 We have used this camera in daylight and well-lit environments, and it performs well. This just isn’t the right tool for the job in these lighting conditions. Canon EOS 5D Mark II – The 5D performed about as expected. Excessive contrast and a soft look are unfortunate traits of this camera system. However, as you can see, the facial outline is clear without artifacts, the hair and neckline are discernable, and minor shadows on the face and neck look far more natural than the AF100. Facial features and contours begin to appear, as well as texture on the lips. Sony PMW-F3L – We knew coming into this test that the Sony was going to walk away as the winner of the MPES Candlelight Shootout. What we didn’t realize was how impressive this new camera really is in low light. Everything about this image is superior. You can see individual shadows of hair on our model’s face and the wisp of hair to the right is distinguishable from the hair lying flat beneath. Full facial features, textures, contours, and (dare I say) imperfections are all completely identifiable. The soft natural glow of the candlelight is reflected beautifully off the cheek, something that the AF100 and 5D just couldn’t do. The definition and latitude of this camera is quite amazing, and is very nearly on par with the RED and Alexa. 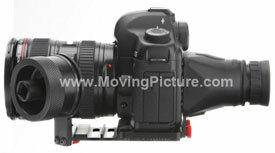 Moving Picture Camera Test (5D vs. AF100 vs. F3) from Moving Picture Media on Vimeo.